Green ICT and environmental responsibility in business is not merely a ‘nice to have‘ or ‘feel good‘ concept; neither is it an issue of reluctant compliance by businesses to ever-growing legislation in the carbon economy. There are substantial fundamental business advantages and values to be derived by taking up environmental responsibility. These advantages and values provide a business with an economic as well as a social edge over its competitors. This is particularly true when astute business leaders are able to correlate their understanding of economic growth with environmental responsibility. Incorporating green ICT in the long-term strategic business approach has much more to offer in terms of market standing, legal compliance, good corporate citizenry, and ability to trade and prosper in the carbon economy. This chapter investigates into such strategic advantages resulting from embracing green ICT, and describes and discusses such strategic views from an economic stand-point. This chapter discusses the concept of business value in the context of the environment. Understanding the nature of this interface is crucial to the incorporation of the vital environmental factors into business strategy. Without a thorough and research-supported understanding of what business values may ensue from embracing sustainable models, most senior executives and decision makers are reluctant to commit resources to the establishment or support of sustainable practices such as green ICT. Profit, as enshrined in the psyche of the early era of capitalism, is still accepted as the prime necessity and the core reason for business. However, in order to create and further the value of a firm, we need to realize that profit is not a sufficient condition for the creation of firm value (Freeman et al., 2007-2008; Figge and Hahn, 2005).H. (2009), in particular, has outlined and expanded on the various values that need to be considered by firms in their quest to measure their ‘return on investment’ (ROI). This ROI, as Younessi (2009) has astutely identified, is not a matter of a single figure or concept. Instead, there are various values that an organization derives from its business strategies or upon which they based them. These are: utility value, (assessed subjectively by customers and related to the concept of product quality), exchange value, realized in the form of revenue and economic profits, and essential value, realized in the fundamental improvement of the societal condition. Additionally, the idea of firm sustainability and longevity needs to be considered- not as an end in and of itself, but as a means to informed decision-making along the course of optimization of these other value drivers. As such, it is essential not to consider pure exchange revenues and costs but rather “total value” derived from optimization strategies. For an example, the reader might consult (Whitten et al. ; 2008) for a very interesting case of the impact of introducing ICT and mobile technologies in the healthcare industry. The general attitude regarding enterprises has been that they will continue to produce indefinitely (Keat and Young, 2005). As a result, major corporations are loathe to develop “end-game” plans, unless the end is inevitable and at times in sight. Despite the fact that demise remains the only certainty – taxation not being as universal – most enterprises are of the attitude that they will continue forever. This is an incorrect attitude. The oldest continuing enterprises on this planet are only several hundred years old. Most organizations do not make it beyond a century and very few make it to 200. The question that becomes critical in this respect relative to the economic value of enterprises is to what extent does longevity matter? 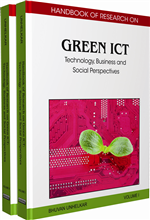 This chapter examines these various business values in the context of the environment and sustainability of ICT business. The demand for sustainable approaches both within firms and at large is increasing, as is demand for firms that take a stand for moral, ethical, ecological and societal concerns. Drivers and motivators for Green ICT has been discussed in detail by Unhelkar (2008, 2009,). As such, these otherwise subjective concerns are now becoming fundamental in any analysis of environmentally responsible business practice. While technology has fuelled the growth in business, we are also discovering that the same technology (and primarily information technology in the case of this article) is also the main cause for greenhouse gas emissions. Therefore, it is important to recognize that, in general, technology needs to be considered inter-alia productivity and progress. In fact, without due strategic considerations and balancing of various values, as discussed in this chapter, information technology will end up being detrimental to not only the environment but also to business. Consider, for example, the fact that the average time spent on a computer at work has increased by more than 60% compared only to a decade ago. Yet almost twice as many people feel that they are less productive in their jobs than workers did ten years ago. The “paperless office” is consuming almost four times the paper the so-called “papered” office. There are many technical, process and social issues that are now intertwined with environmental issues in the context of information and communication technologies. The emergence of such issues has proven inevitable and universal; in the sense that they apply to a wide cross-section of business and are not just limited to ICT. Information Problem: Market inefficiency, sometimes exploited by them, caused by consumers not being properly educated vis-à-vis a firm or product. Green Technology(ies): ICT technologies used to facilitate operation within an environmentally sound framework. Price and Product Differentiation: Products produced by a firm separated according to price and consumer demand.